Continuing the series on No Onion No Garlic recipes, here is a coconut milk based gravy with assorted vegetables. The process is the same as with the conventional kadai but I made it in the Instant Pot to free up some time for me. I am sure this version of coconut milk kurma is popular among the Brahmin communities of the South. I remember having something similar at a friend's house a few years ago. I tried my best to recreate based on my memory. It was enjoyed at home by all of us. Make a paste of all the ingredients listed under 'For the gravy'. Place the inner pot in place. Power on the Instant Pot to 'Saute' mode. Once the display changes to 'Hot', add oil, mustard seeds, urad dal and cumin seeds. After the cumin seeds crackle, add the assorted vegetables. Saute the vegetables for a couple of minutes. Add in the gravy paste and salt. Put the lid on, set the vent to sealing. Set it to 'Manual' or 'Pressure Cook' for 2 minutes. Allow the Instant Pot to do the magic. After the cooking is done, quick release the pressure and the kurma is ready to serve. If the consistency needs to be adjusted as per preference, set the IP to 'Saute' mode and let it simmer for 3-7 minutes. Unplug the IP. Transfer to a serving bowl and garnish with chopped coriander leaves. Serve with Naan/Roti or Rice. I can imagine how flavorful this kurma would be, Harini. The gravy looks so smooth and silky. Any dish with coconut, i'm in, will give a try this version of kurma soon. Fingerlicking goodness,and the thickness of kurma looks absolutely delicious. I can have happily this kurma with some rotis without any fuss. I enjoy the South Cuisine which has the coocnutbased gravies, they taste so good. This kurma sounds delicious and it would team so well with some rotis or even rice. I am sure onion and garlic would not be missed. Such a creamy and delicious Kurma recipe Harini. I am planning to try this. Must be a great side for Roti! Wow! This kurma goes so well with pooris. And I am craving for some even though I had my lunch just now.. The kurma looks so creamy and inviting Harini. 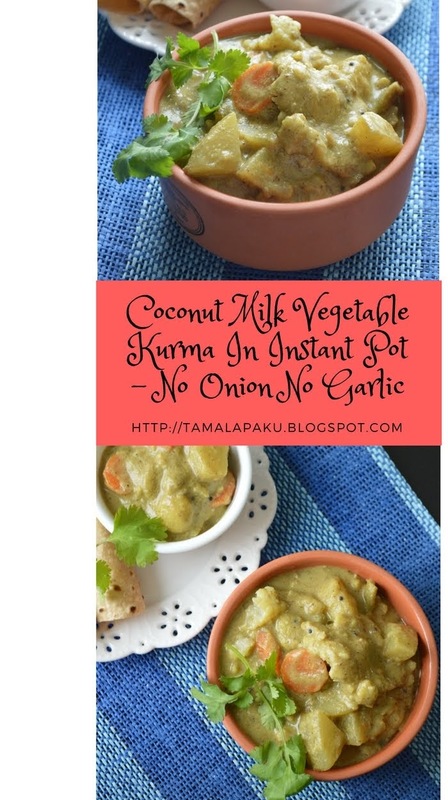 It will be a challenge for me to make a kurma without onion, so will surely make a note of this recipe..
wow such an aromatic kurma , I am loving your instant post versions.. looks super inviting dear !! without onion garlic this dish just rocks, Perfect recipe !! Coconut Milk kurma looks delish!! Will never miss onions or garlic when it is having coconut milk.. I love kurma without yogurt and this recipe fits the bill perfectly. Will try this creamy kurma some time. Love kurma with coconut milk and this no onion no garlic version is perfect for those Thursday and vratham days. Thanks for IP version. I need to try coconut in my kurma or other dishes but I am yet to explore those flavors. The Ip kurma without onion and garlic looks just amazing. A coconut based curry is always tasty. Your preparation looks so creamy. One hardly ever misses garlic and onion in a coconut based curry. I have a recipe for kurma on similar lines given by one of my sisters in law. Your kurma in coconut base sounds very flavorful for non onion and garlic eaters. Ohh yumm, I can eat this as such! Looks totally delicious and perfect with rice/roti or even dosa! I just love the taste coconut based Masala in gravies!! such a lovely medley of vegetables. and so healthy and yummy with both Pooris and rice ! great pick ! Love this flavorful kurma made with coconut milk. I love kurma and make it quite often as a good change from the regular gravy. Looks so delicious. Love the flavors and texture of coconut based korma..